It is believed that nurses’ interaction and direct contact with patients and other persons possibly carrying infectious diseases facilitates a higher susceptibility for contracting such diseases. During pandemics in particular, the aforementioned hypothesis becomes of heightened important due to its ability to aid in pandemic preparedness planning. In the Emerging Infection Diseases® digest published by the Centers for Disease Control and Prevention (CDC), there is a research-based article that speaks to this subject, titled Nurses’ Contacts and Potential for Infectious Disease Transmission. The findings thereof suggest that nurses are in fact at greater risk for the transmission of airborne infectious diseases in comparison to the general population due to the depth and frequency of contact with infected individuals. Further, it is suggested that certain preventative practices—including, but not limited to wearing personal protective equipment—may help to deflect potential infection. 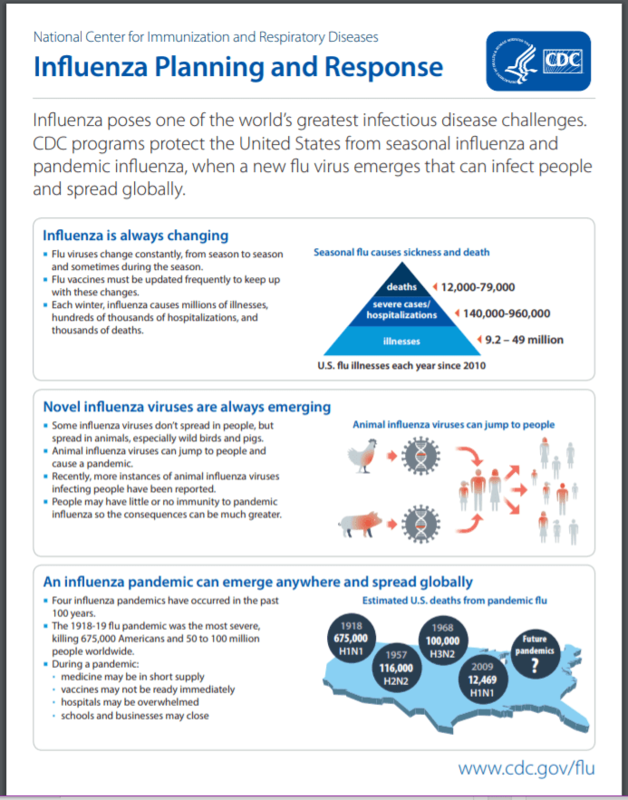 The flu, caused by the influenza virus, is amongst the most pervasive infectious disease in the USA, resulting in the development of an Implementation Plan for the National Strategy for Pandemic Influenza under the auspices of the National Security Council (NSC). Because we cannot predict how bad a future pandemic will be, advance planning is needed at the national, state and local level. Whether the planning is for a government entity, a business, school, community-based organization, or healthcare system, all planning efforts should take into consider[ation] multiple scenarios of a pandemic (e.g. moderate, severe, or very severe) so that they can be ready to respond quickly and take the appropriate measures to continue daily operations. Adhering to the recommendations of the CDC, Erudite Nursing Institute’s™ 5-week accelerated Licensed Practical/Vocational Nurse (LPN/LVN) program incorporates Emergency Preparedness and Response Plan training into the program curriculum. Because Erudite Nursing institute™ is Nursing innovation for the Future ™, our goal is to continue making our students of today the Nursing leaders of tomorrow by training and preparing them for Healthcare matters of national and international import, thereby giving them a competitive advantage in comparison to their co-workers and peers. While not every nursing school can say they adhere to national standards and recommendations, Erudite Nursing Institute™ is honored to continually do so since 2000—nearly 20 years. Because Erudite Nursing Institute™ recognizes and respects the authority and jurisdiction of the National government over the State governments, we feel that Nursing preparedness in accordance with national standards should be mandatory upon all respected and distinguished schools of Nursing—not just ours.